In November of 1917 Bolshevik workers and soldiers successfully overthrew the provisional government that had been established in Russia only eight months earlier following the dissolution of the Tsarist autocracy. Under the guidance of Vladimir Lenin, the Marxist revolution promised land for the peasants, power for the workers, and food for the poor. 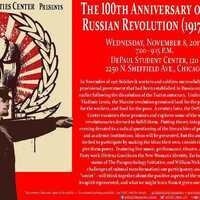 A century later, the DePaul Humanities Center examines these promises and explores some of the methods the revolutionaries devised to fulfill them. Putting theory into practice in an evening devoted to a radical questioning of the hierarchies of public gatherings and academic institutions, ideas will be presented, but the audience will be invited to participate by making the ideas their own, considering how best to give them power. Featuring live music, performance, theatre, a world-premiere film by Our Literal Speed, and reports on Party work (Helena Goscilo on the Women’s Section, and William Nickell on the challenges of cultural transformation) our participatory assembly—our “soviet”—will think together about the positive aspects of the revolution, what its spirit represented, and what we might learn from it given our situation today.